It's the Little Things. . .: I'm Baaaaack!!!!! Did you miss me? Seems like forever since I've blogged or even looked at other people's blogs. The last few weeks have been spent getting ready for vacation, going on vacation, and now, trying to get out of "vacation mode". 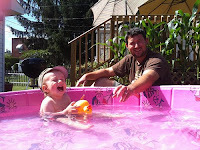 That's Liam and Daddy (Kevin) playing in the pool and then Izzie. We had only seen pictures of Izzie and she's much more beautiful in person! We had a wonderful time visiting with our daughter, Ruth, her hubby, Kevin (they drove in from Long Island, NY); our son, Scott, and his wife, Steffi. We also had a wonderful time with Steffi's parents, Konrad and Brigitte, who live directly across the street. So now we're back and I'm trying to get back into my routine again! I haven't gone to any garage/yard sales or to the Goodwill over the past few weeks; however I did stop at the Goodwill store last night. Picked up a couple of items but I'll have to show you those later! Awww...they're both so cute! Izzie's eyes are beautiful!! I know you had a wonderful time visiting with all of them. So glad to see you are back! I thought I might see some pics of you and Sue at a quilt shop buying up all the fabric!